We told you three weeks ago that Bears offensive coordinator Mike Martz was beating the bushes looking for potential backup quarterbacks, including a trip to Moscow Idaho to visit with Nathan Enderle. The trip was a productive one. 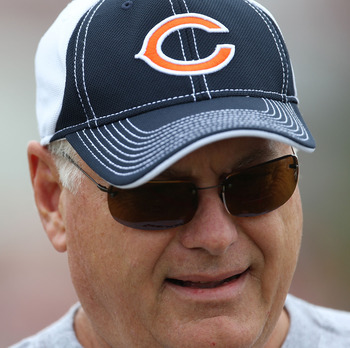 Martz convinced the Bears to take Enderle on Saturday with the No. 160 overall pick. It was Chicago’s only fourth pick of the draft, so it’s not one to take lightly. The Bears want long-term options to develop behind Jay Cutler other than Caleb Hanie. Martz has only one year left on his contract. He is going to have a lot of leverage because the team is putting a lot of resources into finding guys that fit his system. We’ve admired Mike Shanahan’s un-Redskins-like approach of stockpiling draft picks this weekend. Still, it’s been a surprise they haven’t used any of their eight selections in the first six rounds on a quarterback. 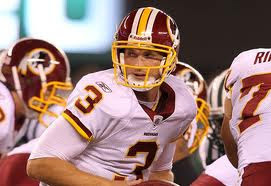 So with Donovan McNabb on the way out and Rex Grossman a free agent, who will be Washington’s starting quarterback? Can we interest you in a little John Beck, Redskins fans? Not liking this rookie crop is one thing. Pinning your hopes on Beck is another. The Redskins are trying to sell the idea that Beck had better stats as a senior at BYU than anyone in the draft. That ignores the fact that Beck played in a weak conference and he hasn’t taken a snap in a game since 2007, when he was a disaster. Beck is turning 30 years old this year and he has one career touchdown. The Redskins say they love him, but they didn’t play him at all last year when Rex Grossman finished up the season. No matter how much Shanahan believes in Beck, we have to believe for the sake of their fanbase that Washington’s starting quarterback isn’t yet on the roster. Year after year, you can count on the Redskins signing a lot of free agents. And lacking draft picks. Mike Shanahan finally broke the trend this year. By trading down from No. 10 to No. 16 in the first round, the Redskins picked up extra picks and then leveraged those picks to pick up more in a series of trades down. All in all, the Redskins have picked up five extra draft picks thus far. While they all won’t work out, this is exactly what the Redskins need. The team has one of the thinnest rosters in the league, bereft of young quality talent at nearly every position. This approach may not make sense for every team every year, but it’s the perfect way to go for the 2011 Redskins. And it’s something they simply haven’t done in the past. It’s not Christian Ponder’s fault the Vikings took him too high. It’s not Jake Locker’s fault that Vince Young’s tantrums and lockout uncertainty left the Titans desperate for a quarterback. But life in the NFL isn’t always fair, and the NFL minted four new “franchise quarterbacks” in the top 12 picks on Thursday night that aren’t likely to be ready for the role. Cam Newton, Blaine Gabbert, Locker, and Ponder will have to overcome a lot to become successful pros, starting with unfair expectations created because their teams reached too high to take them. Newton has all the raw talent in the world, but the Panthers will have to be patient and build the team around his unique skills. He’ll have to learn how to overcome adversity, but he’s the one guy in this group that would have gone high in any draft. Locker is coming off a very disappointing senior season and faces serious questions about his accuracy. The Titans chose him at No. 8 over Blaine Gabbert because Locker is such a good athlete and they love his intangibles. Vince Young was also a better athlete than a passer. Gabbert was hyped by the draftniks as a top-five quarterback because he looked the part despite a college career that didn’t blow anyone away. He has plenty of talent and athleticism, but it’s worth noting the following quarterback needy teams passed on him: Buffalo, Cincinnati, Arizona, San Francisco, Tennessee, and finally Washington, who traded their No. 10 pick to Jacksonville. Ponder, taken No. 12 overall by the Vikings, was the night’s biggest surprise. Coming off an injury-plagued senior season without a great arm, Ponder doesn’t fit the profile of a top-15 pick. Vikings fans certainly didn’t think so; they booed the selection at a team-sponsored draft party Thursday night. Translation: We reached for him. Spielman wasn’t alone, which made a lot of teams go nutty for an unremarkable quarterback class. There were more teams than usual looking for starting quarterbacks, even before the lockout started. The lack of free agency and trades before the draft compounded the problem, making teams anxious to fill their depth charts and sell their fanbases on new hope. Four quarterbacks were taken in the top 12 this year, but this isn’t like when Eli Manning, Philip Rivers, and Ben Roethlisberger all went in the top 11 in 2004. 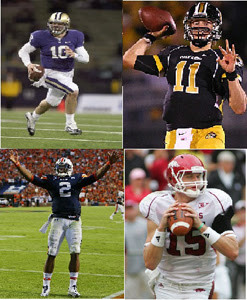 This fourpack of quarterbacks is a boom or bust group, and they are bound to get some decision makers fired. We’re actually surprised that teams didn’t trade back into the end of the first round to grab TCU’s Andy Dalton or Arkansas’ Ryan Mallett. That means we could have another quarterback frenzy to start day two of the draft. At least the cost Friday won’t be as high as it was for Newton, Locker, Gabbert, and Ponder. After moving back in the first round, the Chiefs then moved up one spot in the first round without having to give anything. The Ravens were on the clock with the No. 26 pick but ran out of time, so the Chiefs passed them and wound up selecting wide receiver Jonathan Baldwin out of Pittsburgh. ESPN’s Adam Schefter repors the Ravens and Bears were talking trade, and Baltimore believed they had a deal done. It fell through, and they let Kansas City pick. Kansas City’s selection is a surprising one, but they need to upgrade their receivers. Baldwin took some criticism for his hands in college and his character, but his talent to get jump balls in the red zone is undeniable. Baldwin is a potential future No. 1 receiver, perhaps the only one left in this draft. He’s a similar style player to Dwayne Bowe. That either doesn’t bode well for Bowe’s chances for a long-term deal with the Chiefs or it doesn’t bode well for cornerbacks that have to deal with the Chiefs in coming years. It's been a long, gloomy off-season so far, with nothing but talk of a lock out and fans left wondering if the 2012 season is in jeopardy. Without Free Agency and March OTAs, we haven't had much to discuss or look forward to, but the draft is now just around the corner! We here at The Football ERA decided to celebrate by putting together a mock draft. You'll get my analysis on every pick in the first round as well as some commentary from the brains behind The Football ERA, our Editor-in-Chief, Shaq. We have been posting this column in a series of several posts over the weekend and this week leading up to the draft. Today, we have a final repost of the entire mock draft. TRG: I’m going out on a limb with this one, but the one thing everyone agrees on is that there is no “sure thing” at QB this year. Carolina’s owner expressed publically that he wasn’t completely sold on Cam Newton, and while he lets his personnel men do their jobs, it gets me thinking that this could be another Maro Williams-Reggie Bush scenario. The Panthers have already invested a 2nd round pick into Jimmy Clausen last year. Already light on draft picks (no second round pick this year), they simply have too many other holes that need filling. The run defense came in at 23rd overall last year, and you can bet Ron Rivera, a defensive-minded coach, wants to turn that around. They would absolutely trade down if they could, but no one else has a reason to trade up. TRG: Carolina not taking Cam Newton hurts the Broncos more than anyone, as DT is a glaring need. However, with Dareus off the board, Von Miller is the best player available and would form a very good pass-rush tandem with Elvis Dumervil. The Broncos may also consider Da’Quan Bowers, Patrick Peterson, or perhaps even Nick Fairley, but I think it is too hard for them to pass up one of the elite prospects in this draft. Small chance they could trade down from here with Newton and Miller on the board, but it seems unlikely unless a team in the ‘teens particularly wants either player. SHAQ: Marcell Dareus will fall to Denver if Carolina indeed chooses a quarterback, but Denver clearly has needs on defense. They really can’t lose sitting in the #2 draft spot because Von Miller would be a very versatile choice for them as well as a defender they could use in their new 4-3 scheme. 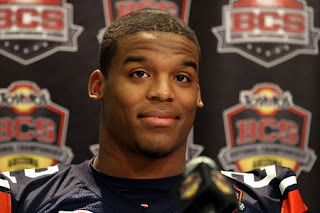 TRG: And Buffalo wins the Cam Newton sweepstakes! While Fitzpatrick did an admirable job last year, he is not a viable long-term solution, and the Bills need to sell tickets just as much as anyone else. Newton comes with risk, but he’ll immediately be a draw for the fans. Fitzpatrick does give Buffalo the luxury of bringing Newton on slowly, however. Defense is a bigger need, but with Dareus and Miller off the board and a Bills franchise enamored with Cam Newton, there’s no way they’d pass him up. SHAQ: Judging from a clip of the Bill’s owner commenting on the draft on NFL network, it seemed that he was implying that they are ready to use their high draft position on a top quarterback prospect—even though he was trying to disguise their intentions. I think they know that the opportunity to draft either Cam Newton or Blaine Gabbert will fall right into their lap. TRG: I firmly believe the Bengals are going to draft a QB here, even if it’s only to piss off Carson Palmer. Bengals owner Mike Brown is notorious for not backing down in situations that become public with players, an Gabbert would give them a lot of leverage. Reports have emerged in April claiming that Bengals ownership is optimistic about Palmer returning, but that is just as likely to be a smokescreen. If both QBs are gone, I’d look for the Bengals to take Quinn, Green, or trade down. SHAQ: There is hardly a mock draft out there (except for Erik’s) that doesn’t have A.J. Green going to the Cincinnati Bengals, and who am I to buck the trend. The question still remains as to who will be throwing to him when the season starts. TRG: Quinn has been moving further up in mocks the entire off-season, and with good reason. Widely regarded as a top prospect prior to missing the entire 2010 season, Quinn put up fantastic numbers at his pro-day, and there’s plenty of film on him from 2009. With questions surrounding Nick Fairley’s motor and Da’Quan Bowers’ knee, Quinn looks like the 3rd best pass-rushing prospect available. The Cardinals may consider Patrick Peterson here, but ultimately I think their needs up front outweigh the need in the secondary. SHAQ: Arizona won’t be on the clock very long if Von Miller still remains on the board, and it will be foolish for them to pick anything but defense with their choice. That hasn’t stopped speculation that they will choose a quarterback to try and put an end to the quarterback debacle they experienced last year. I think that would be a mistake and only an extension of that debacle. TRG: This pick will tell us how precisely how committed the Browns are to Colt McCoy. He needs weapons on that offense and Green would be a starter and make an immediate impact. I think there is an equally strong likelihood that Cleveland trades down to address the many needs they have this off-season. They are in a great spot in the top 10, and I wouldn’t be surprised if someone is willing to trade up to take Patrick Peterson, Nick Fairley, or A.J. Green. SHAQ: Even though the Browns picked a cornerback last year in Joe Haden, Mike Holmgren probably realizes you can’t have enough high caliber cornerbacks especially with the League becoming so Pass happy these days. Patrick Peterson is too good to pass up, and will definitely not be left on the board beyond the 49ers seventh overall pick. TRG: Every mock on the planet has Peterson going to the Niners, and if he is available, he’ll be the pick. The secondary was a constant trouble spot for SF, and the team is likely to part ways with Nate Clements, who is overpaid and under-performing at this point. If Peterson is gone, I think the Niners will look long and hard at Nick Fairley, as free agent DT Arbroyo Franklin has indicated he wants to test free agency. If AJ Green is still on the board, San Francisco may be able to leverage a trade and move back a few spots. SHAQ: Miffed at coming so close to landing Patrick Peterson, San Francisco will remain undeterred in getting a top flight cornerback, fulfilling a major need on their defense. Prince Amukamara goes to the Niners. TRG: Ironically, Fairley is drawing comparisons to Albert Haynesworth, and the Titans have yet to fill the hole left by his departure. The defense struggled mightily last season, coming in 26th in yards allowed. They may also strongly consider drafting an offensive lineman here, as they had one of the worst run blocking lines in the NFL. Lucky for them, Chris Johnson is not your average running back and can make do. Fairley represents a better value than any offensive line prospects on the board, so he’s the pick if available. SHAQ: Well if I had gone Defensive Tackle to open my version of The Rambling Gambler’s mock draft, then I would be mostly echoing his choices which would be quite boring. Instead we meet at Nick Fairley going to Tennessee as he is clearly one of the best choices still left on the board in this draft which is heavy on defensive lineman. TRG: This is another pick that has been in most mocks, but it makes a lot of sense. The Cowboys need a long-term starter opposite Doug Free, and if they can get a solid tackle with this pick, they will be set at the position for a long time. Jerry Jones is said to be enamored with Patrick Peterson, so it remains possible that the Cowboys could try to trade up to take him at #6. If not, with 6 defensive players going in the top 8 picks, the Cowboys get solid value getting the top offensive tackle prospect in the draft. It’s also a possibility they could trade down if they are set on drafting an offensive lineman… Nate Solder, Anthony Castonzo, and Gabe Carimi could all be available in the second half of the draft. Prince Amukamara could be the pick here, but there have been constant rumors that the Cowboys aren’t sold on him. SHAQ: Jerry Jones has never used a first round draft pick on an offensive line so let the defensive lineman craziness continue. JJ Watt goes to the Cowboys. TRG: Rumors of Washington selecting a QB with the 10th pick have been swirling since the beginning of the off-season, and Locker-to-Washington is really picking up some steam leading up to the draft. However, the Redskins have many needs and few picks in the 2011 draft. Ideally, I think they would like to trade down and collect additional draft picks, and possibly take a QB prospect that they like that falls to later in the round. With Jones and Locker available, they may be able to find a trading partner. If they do pick at 10, Julio Jones is certainly the safer choice when comparing to any of the remaining QBs. The offense lacks playmakers, and would be an impact starter on the offense. SHAQ: Let’s hope the Redskins come to their senses and draft something other than Quaterback which is not necessarily a huge need, but the rumor is that Ryan Mallett and his big arm has Mike Shanahan enamored. Julio Jones would be a wiser selection. TRG: While many mocks have Houston taking a pass-rusher here, I don’t see how the team ranked dead-last in passing defense can pass up the second best CB in the draft. 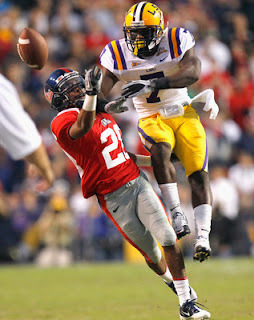 He had a very strong combine and his measurables were very similar to Patrick Peterson’s. Houston is transitioning to a 3-4 defense and does need to add pass rushers, but shoring up the secondary should be a top priority for the Texans. SHAQ: Da’Quan Bowers stock continues to fall so Houston may very well take Robert Quinn whose stock is rising. TRG: The Vikings have a huge need at QB, unless you think Joe Webb is the QB of the future. Locker will be a highly controversial pick, with pundits either pointing to his poor statistics at Washington, or to being a great QB plagued by a bad offensive line and receivers. Regardless, Minnesota has expressed interest, and they are not shy about pulling the trigger on the players they want (Adrian Peterson and Randy Moss are two examples of draft picks that didn’t go over well on draft day). Da’Quan Bowers will be a temptation for Minnesota in this spot, but ultimately I think they’ll nab their next QB. SHAQ: The Vikings might feel they have Quaterback needs, but how do they pass on Da’Quan Bowers if he falls to them at number 12. With Ray Edwards due to be a free agent (if there is a free agency), the Vikings don’t miss this opportunity to take a top rated defensive lineman. TRG: With Prince Amukamara off the board, the Lions will focus on protecting fragile franchise QB Matthew Stafford. He’s yet to play 16 games in a season and no doubt a shaky offensive line has contributed to his injury problems. Solder is quite the prospect, standing 6’8” and weighing in between 310-320. Some analysts even have him pegged as the top tackle prospect in this year’s draft. With no one on the roster looking like a long-term starter at tackle, I expect the Lions to fill that need in the first round. SHAQ: I agree with the Rambling Gambler that the Lions will go offensive line, having settled their defensive line with Ndamukong Suh last year. 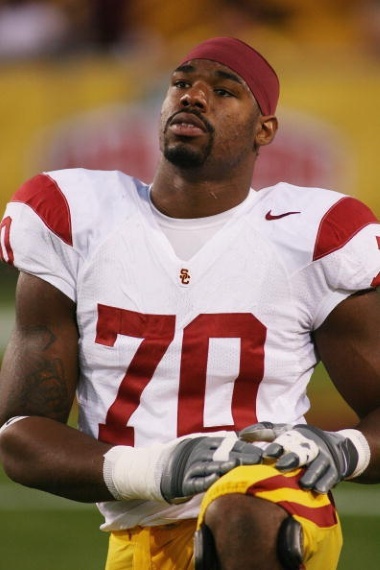 However, the offensive lineman they choose will be Tyron Smith. TRG: There is no greater wild card on day one than Da’Quan Bowers. With so much misinformation being spread in April, it’s impossible to get a definitive report on the health of his knee. A poor performance at his pro-day only created cause for more concern, and as such, a player once consider to be a possible top pick may fall out of the top 10 all together. Some still think he may be a top 3 pick, but I think most of the teams drafting the first ten picks would rather play it safe and can address their needs with a different top prospect. The Rams want A.J. Green or Julio Jones, but they won’t pass on an elite pass-rusher with the 14th pick, injury concerns or not. SHAQ: California’s Cameron Jordan’s stock has been steadily rising, and the Rams don’t pass up the opportunity to take a shot at the Golden Bear. TRG: The Dolphins were a disappointing team last year… After failing at an attempt to replace head coach Tony Sparano, Chad Henne will be the next in line to lose his job. I don’t think the Dolphins are willing to let Henne struggle again this season, and with Pennington suffering an injury during this offseason, I think they go quarterback here. Having expressed a desire to have a vertical offense, I think they may give Ryan Mallet a shot. His arm is considered to be one of the best in this QB class, if not the best. The concerns about Mallet are regarding his character and ability to lead, but with recent reports coming out to the contrary, you have to wonder how much pre-draft smoke-screening is going on here. Mallet has visited the Dolphins twice so far leading up to the draft. SHAQ: The Dolphins would love to have one of the top two quarterbacks on the board fall to them—no chance. 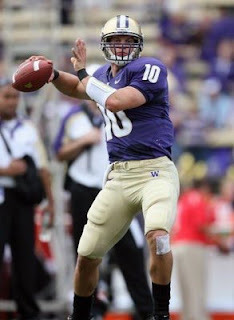 So do they go Jake Locker or Ryan Mallett even though he is pre-draft stock has been questioned. Either is a gamble, but they go for the big arm in Mallett. 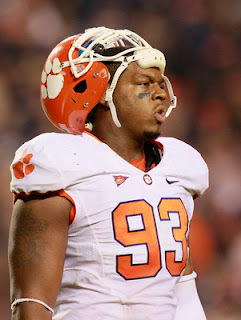 TRG: If Locker falls, I suspect the Jaguars may draft him with this pick, but in my mock they’re left with Aldon Smith. The Jags ranked 30th in sacks last year, generating only 26. While they have several positions of need, a pass rusher has to be a top priority. Smith has been drawing comparisons to Demarcus Ware and Willie McGinest, and can play DE in the Jaguars 4-3 defense. Smith may very well go higher in the draft, in which case Jacksonville would likely look to J.J. Watt or Ryan Kerrigan. SHAQ: Either Aldon Smith or Ryan Kerrigan would be the perfect pick for the Jags. Just for argument’s sake, Jacksonville picks Kerrigan. 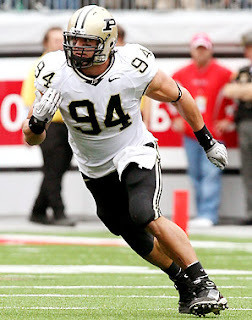 TRG: Kerrigan played as a DE in college, but at 6’3” 267, he is being projected as a line-backer in 3-4 defenses. Several 3-4 teams have had interest in Kerrigan, and he should be available when the Patriots make their first pick of the round. Kerrigan would provide a good outside-backer to go with ILB Jerod Mayo and shore up the front 7. While the Patriots don’t have many immediate needs, the futures of Matt Light and Logan Mankins are uncertain at this point, so getting some additional depth on the offensive line may be considered here. SHAQ: Its no secret that Logan Mankins was not happy with the Patriots lack of commitment to him, so New England takes Anthony Castonzo out of Boston College. TRG: While the Chargers may have had one of the best defenses on paper last year, it was clear that they need another pass-rushing presence at DE or LB, and I really don’t expect them to stray from either of those positions in the first round. The Chargers have been strongly linked to Ryan Kerrigan; Brooks Reed could be a possible candidate here as well. SHAQ: Aldon Smith is too good to pass up and falls to San Diego. TRG: It’s not even clear who the Giants start would be at left tackle right now, and that’s a very bad thing. With a deep crop of first round tackle prospects this year, I fully expect the Giants to draft the best available. In this mock, it’s Castonzo, though he very well could be gone. If so, the Giants would probably end up with Gabe Carimi or Derek Sherrod. SHAQ: Mike Pouncey is taken by the New York Giants to bolster their aging offensive line. TRG: The Bucs are another team seeking a pass-rusher, with most analysts having DE as their top need. I think Tampa would be thrilled if Bowers, Smith, or Watt somehow fell to them at 20. 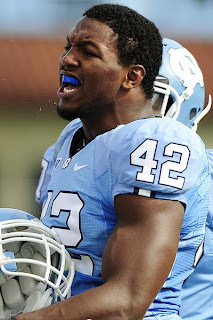 With those prospects gone, I’m going to go out of a limb and say they go for Jimmy Smith. Ronde Barber is 36 years old, and Jimmy Smith is talented enough to take over when the time comes. While there have been many reports raising red flags about his character, Jimmy Smith turned in a combine performance that was right up there with Patrick Peterson’s; not a bad spot for the Bucs to take a risk on that kind of talent. SHAQ: The Bucs desperately want a great pass rushing defensive end. Then Aqib Talib goes and gets himself arrested—for murder no less. Tampa Bay nabs Jimmy Smith. TRG: The chiefs could address several needs with this pick, but I think they’re going to get a lineman. The offensive line could use another tackle opposite Brandon Albert, but unless they really like one of the remaining prospects available, Wilkerson will be an immediate asset on the defensive line. With two defensive tackles likely two become free agents, Wilkerson can be a versatile player on the line. At 6’4”, 314 lbs, he could step in at DT if need be, or slide over to end should the Chiefs retain one of their existing tackles. SHAQ: Gabe Carimi out of Wisconsin makes for a great addition to the Kansas City Chiefs’ offensive line. TRG: The offensive line can certainly use an infusion of talent and the Colts need to protect their aging franchise quarterback. While the Colts do have need on their interior defensive line, with Wilkerson off the board, it seems unlikely that they’ll reach for a defensive lineman here. Carimi is another highly touted tackle prospect coming off an excellent combine and has the athleticism and length to potentially play left tackle. SHAQ: With Payton Manning begging for offensive line help, the Colts still make the right choice in drafting defensive tackle Corey Liuget. TRG: The Eagles surely want to add talent to the secondary after giving up way too many big plays last season. Unfortunately, with Jimmy Smith off the board, none of the remaining defensive backs will be a good value here. Defensive tackle may not be considered a top need for the Eagles, but Liuget would be tough to pass up. With his stock rising throughout the off-season, he’s seen as the clear cut third defensive tackle off the board. 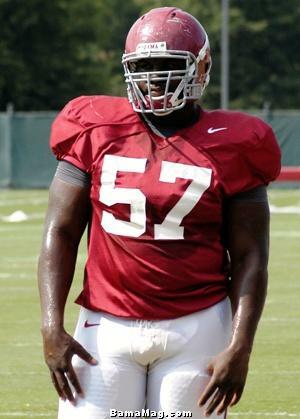 His size (6’2”, 298) is best suited for the 4-3 and he would make an impact up front for the Eagles. I could also see the Eagles trading down here, as we could see several teams try to move back in to the first round to get one of the top remaining QB prospects. SHAQ: Nate Solder makes Andy Reid happy as he solidifies his already explosive offense with a solid offensive lineman. TRG: The Saints are expected to address defensive needs with this draft and continue to build depth. The addition of Shaun Rogers allows them to focus on adding a playmaker at end or linebacker. Brooks Reed is gaining momentum after posting combine numbers similar to those of Clay Matthews and the Saints could certainly use an explosive player at linebacker. With most of the top pass rushers gone at this point, the Saints are another team that could trade down. SHAQ: Muhammed Wilkerson is taken by the Saints to get the immediate help they need on defense up front. TRG: The Seahawks certainly seem to be on a hunt for a quarterback in the draft class, having met with Dalton, Mallet, Locker, and Kaepernick. Dalton is considered to be the most “NFL ready” and fits the west-coast offense. Hasselbeck will be 36 years old this season and has a hard enough time surviving behind Seattle’s offensive line as it is already. With no heir-apparent on the roster, they need to find one. SHAQ: Everybody seems to have the Seahawks going quarterback to develop under an aging Matt Hasselback. I can’t see them passing on Andy Dalton. TRG: As much as the Ravens need a wide receiver, unless they trade up for Green or Jones, none of the remaining prospects are seen as a good value in this draft slot. Houston wouldn’t be needed immediately, but 30 year-old OLB Jarrett Johnson is entering the final year of his contract. Moreover, with Ray Lewis likely only playing another season or two at most, the Ravens will need a pass rushing linebacker in the near future. Houston has tremendous ability, posting combine numbers comparable to Von Miller and Robert Quinn. Questions have been raised about his motor and he’s been described as lackadaisical, but he produced in college and has the talent to produce in the pros. SHAQ: Ravens opt to bolster their offensive line with Derek Sherrod. TRG: The Falcons have three starting offensive lineman heading to free agency, so it’s almost a lock that they need to take the best offensive lineman available. Sherrod is the last remaining first round tackle prospect in my mock, though the Falcons may consider Guards Mike Pouncey or Danny Watkins, if available or if Sherrod is off the board. SHAQ: With Adrian Clayborn still on the board, the Falcons pick up depth for their pass rushing corps. TRG: The future of the Patriots offensive line is in flux, with franchise-tagged Logan Mankins wanting a long-term deal and Matt Light coming off an injury and bad-mouthing Patriots owner Robert Kraft when discussing the lockout. The Patriots value versatility, and Mike Pouncey is already viewed as a guard/center, and some scouts have said he could even fill in at tackle. While he may not be called upon to start right away, his presence would give the Pats a little more flexibility and depth at the position, allowing them to part with one of their aforementioned linemen, if need be. SHAQ: With Mark Ingram still sitting in Radio Hall waiting for his cell phone to buzz, the Patriots make the call. TRG: The Bears led the league in sacks allowed in the 2010 season and can stand to improve at any position along the offensive line. Ideally they would like one of the tackles to fall here, but realistically they’ll probably end up getting Pouncey or Watkins. Considered by some to be the top guard in the draft, he would immediately step in and improve the Bears interior line. He also has the size and arm-length to attempt playing tackle. SHAQ: Marvin Austin, DT out of North Carolina. TRG: Ayers was considered a sure bet to go in the top 20 until he turned in a poor performance at the combine. Consequently, he should be available when the Jets pick near the end of the round and they have a need at outside linebacker, opposite Calvin Pace. Ayers was extremely productive in college and that will likely keep him from falling out of the first round entirely. Phil Taylor, DT, would also be a good fit here as Kris Jenkins is no longer on the roster. The Jets are also in a good position to consider trading down here as well. SHAQ: Jets go defense with Akeem Ayers out of UCLA. TRG: I’m not projecting trades in my mock, but if the Steelers are left without any of the first round offensive line prospects here, I wouldn’t be surprised to see them trade down. I also wouldn’t be surprised to see them trade up a few spots to secure Derek Sherrod or Danny Watkins. Pittsburgh’s biggest needs are at corner and offensive line, and Williams may be considered a reach here. Regardless, the need is so great for securing either position that I think they’re forced to take the best available corner if they remain in this spot. SHAQ: I have to agree that Pittsburgh is looking for defensive secondary help--so they nab Aaron Williams out of Texas. TRG: With Cullen Jenkins a free agent, the Packers need depth on the d-line. Cameron Jordan has been a prospect in flux, but there is concern about his pass-rushing ability after only producing 16.5 sacks in 32 college games. Nonetheless, he impressed at Senior Bowl practices and the combine and fits perfectly as a 3-4 defensive end. Mark Ingram may also be tempting, as the Packers backfield consists of Starks, Ryan Grant coming off an injury, and soon-to-be free agent Brandon Jackson. SHAQ: Justin Houston, OLB out of Georgia. By Erik Laurinovics, "The Rambling Gambler"
We have been posting this column in a series of several posts over the weekend and this week leading up to the draft. We will have a post of the full mock draft for you on Wednesday. Today, we're taking a look at the top ten picks. I’m going out on a limb with this one, but the one thing everyone agrees on is that there is no “sure thing” at QB this year. Carolina’s owner expressed publically that he wasn’t completely sold on Cam Newton, and while he lets his personnel men do their jobs, it gets me thinking that this could be another Maro Williams-Reggie Bush scenario. The Panther have already invested a 2nd round pick into Jimmy Clausen last year. Already light on draft picks (no second round pick this year), they simply have too many other holes that need filling. The run defense came in at 23rd overall last year, and you can bet Ron Rivera, a defensive-minded coach, wants to turn that around. They would absolutely trade down if they could, but no one else has a reason to trade up. Carolina not taking Cam Newton hurts the Broncos more than anyone, as DT is a glaring need. However, with Dareus off the board, Von Miller is the best player available and would form a very good pass-rush tandem with Elvis Dumervil. The Broncos may also consider Da’Quan Bowers, Patrick Peterson, or perhaps even Nick Fairley, but I think it is too hard for them to pass up one of the elite prospects in this draft. Small chance they could trade down from here with Newton and Miller on the board, but it seems unlikely unless a team in the ‘teens particularly wants either player. And Buffalo wins the Cam Newton sweepstakes! While Fitzpatrick did an admirable job last year, he is not a viable long-term solution, and the Bills need to sell tickets just as much as anyone else. Newton comes with risk, but he’ll immediately be a draw for the fans. Fitzpatrick does give Buffalo the luxury of bringing Newton on slowly, however. Defense is a bigger need, but with Dareus and Miller off the board and a Bills franchise enamored with Cam Newton, there’s no way they’d pass him up. I firmly believe the Bengals are going to draft a QB here, even if it’s only to piss off Carson Palmer. Bengals owner Mike Brown is notorious for not backing down in situations that become public with players, an Gabbert would give them a lot of leverage. Reports have emerged in April claiming that Bengals ownership is optimistic about Palmer returning, but that is just as likely to be a smokescreen. If both QBs are gone, I’d look for the Bengals to take Quinn, Green, or trade down. Quinn has been moving further up in mocks the entire off-season, and with good reason. Widely regarded as a top prospect prior to missing the entire 2010 season, Quinn put up fantastic numbers at his pro-day, and there’s plenty of film on him from 2009. With questions surrounding Nick Fairley’s motor and Da’Quan Bowers’ knee, Quinn looks like the 3rd best pass-rushing prospect available. The Cardinals may consider Patrick Peterson here, but ultimately I think their needs up front outweigh the need in the secondary. 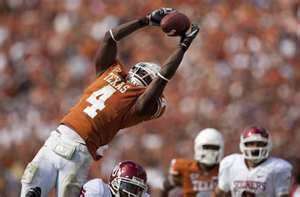 This pick will tell us how precisely how committed the Browns are to Colt McCoy. He needs weapons on that offense and Green would be a starter and make an immediate impact. I think there is an equally strong likelihood that Cleveland trades down to address the many needs they have this off-season. They are in a great spot in the top 10, and I wouldn’t be surprised if someone is willing to trade up to take Patrick Peterson, Nick Fairley, or A.J. Green. Every mock on the planet has Peterson going to the Niners, and if he is available, he’ll be the pick. The secondary was a constant trouble spot for SF, and the team is likely to part ways with Nate Clements, who is overpaid and under-performing at this point. If Peterson is gone, I think the Niners will look long and hard at Nick Fairley, as free agent DT Arbroyo Franklin has indicated he wants to test free agency. If AJ Green is still on the board, San Francisco may be able to leverage a trade and move back a few spots. SHAQ: Miffed at coming so close to landing Patrick Peterson, San Francisco will remain undeterred in getting a top flight cornerback. Prince Amukamara goes to the Niners, fulfilling a major need on their defense..
Ironically, Fairley is drawing comparisons to Albert Haynesworth, and the Titans have yet to fill the hole left by his departure. The defense struggled mightily last season, coming in 26th in yards allowed. They may also strongly consider drafting an offensive lineman here, as they had one of the worst run blocking lines in the NFL. Lucky for them, Chris Johnson is not your average running back and can make do. Fairley represents a better value than any offensive line prospects on the board, so he’s the pick if available. This is another pick that has been in most mocks, but it makes a lot of sense. The Cowboys need a long-term starter opposite Doug Free, and if they can get a solid tackle with this pick, they will be set at the position for a long time. Jerry Jones is said to be enamored with Patrick Peterson, so it remains possible that the Cowboys could try to trade up to take him at #6. If not, with 6 defensive players going in the top 8 picks, the Cowboys get solid value getting the top offensive tackle prospect in the draft. It’s also a possibility they could trade down if they are set on drafting an offensive lineman… Nate Solder, Anthony Castonzo, and Gabe Carimi could all be available in the second half of the draft. Prince Amukamara could be the pick here, but there have been constant rumors that the Cowboys aren’t sold on him. Rumors of Washington selecting a QB with the 10th pick have been swirling since the beginning of the off-season, and Locker-to-Washington is really picking up some steam leading up to the draft. However, the Redskins have many needs and few picks in the 2011 draft. Ideally, I think they would like to trade down and collect additional draft picks, and possibly take a QB prospect that they like that falls to later in the round. With Jones and Locker available, they may be able to find a trading partner. If they do pick at 10, Julio Jones is certainly the safer choice when comparing to any of the remaining QBs. The offense lacks playmakers, and would be an impact starter on the offense. The National Football League announced that a record 25 players are confirmed to attend the 2011 NFL Draft at Radio City Music Hall in New York City. We'll be posting this column in a series of three posts over the weekend and in the week leading up to the draft, with a post of the full draft on Wednesday, 4/27. Today, we're taking a look at picks 11-32--and on Tuesday--picks 1-10. We'll be having a repost of the mock draft on Wednesday. While many mocks have Houston taking a pass-rusher here, I don’t see how the team ranked dead-last in passing defense can pass up the second best CB in the draft. He had a very strong combine and his measurables were very similar to Patrick Peterson’s. Houston is transitioning to a 3-4 defense and does need to add pass rushers, but shoring up the secondary should be a top priority for the Texans. The Vikings have a huge need at QB, unless you think Joe Webb is the QB of the future. Locker will be a highly controversial pick, with pundits either pointing to his poor statistics at Washington, or to being a great QB plagued by a bad offensive line and receivers. Regardless, Minnesota has expressed interest, and they are not shy about pulling the trigger on the players they want (Adrian Peterson and Randy Moss are two examples of draft picks that didn’t go over well on draft day). Da’Quan Bowers will be a temptation for Minnesota in this spot, but ultimately I think they’ll nab their next QB. SHAQ: The Vikings might feel they have Quaterback needs, but how do they pass on Da’Quan Bowers if he falls to them at number 12. With Ray Edwards due to be a free agent, the Vikings don’t miss this opportunity to take a top rated defensive lineman. With Prince Amukamara off the board, the Lions will focus on protecting fragile franchise QB Matthew Stafford. He’s yet to play 16 games in a season and no doubt a shaky offensive line has contributed to his injury problems. 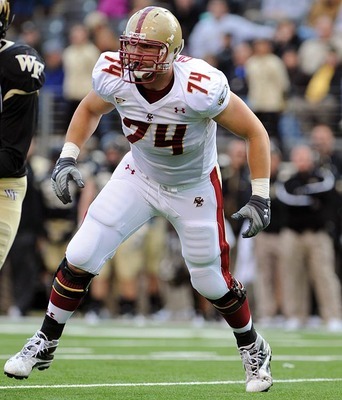 Solder is quite the prospect, standing 6’8” and weighing in between 310-320. Some analysts even have him pegged as the top tackle prospect in this year’s draft. With no one on the roster looking like a long-term starter at tackle, I expect the Lions to fill that need in the first round. Da’Quan Bowers. With so much misinformation being spread in April, it’s impossible to get a definitive report on the health of his knee. A poor performance at his pro-day only created cause for more concern, and as such, a player once consider to be a possible top pick may fall out of the top 10 all together. Some still think he may be a top 3 pick, but I think most of the teams drafting the first ten picks would rather play it safe and can address their needs with a different top prospect. The Rams want A.J. Green or Julio Jones, but they won’t pass on an elite pass-rusher with the 14th pick, injury concerns or not. The Dolphins were a disappointing team last year… After failing at an attempt to replace head coach Tony Sparano, Chad Henne will be the next in line to lose his job. I don’t think the Dolphins are willing to let Henne struggle again this season, and with Pennington suffering an injury during this offseason, I think they go quarterback here. Having expressed a desire to have a vertical offense, I think they may give Ryan Mallet a shot. His arm is considered to be one of the best in this QB class, if not the best. The concerns about Mallet are regarding his character and ability to lead, but with recent reports coming out to the contrary, you have to wonder how much pre-draft smoke-screening is going on here. Mallet has visited the Dolphins twice so far leading up to the draft. If Locker falls, I suspect the Jaguars may draft him with this pick, but in my mock they’re left with Aldon Smith. The Jags ranked 30th in sacks last year, generating only 26. While they have several positions of need, a pass rusher has to be a top priority. Smith has been drawing comparisons to Demarcus Ware and Willie McGinest, and can play DE in the Jaguars 4-3 defense. Smith may very well go higher in the draft, in which case Jacksonville would likely look to J.J. Watt or Ryan Kerrigan. Kerrigan played as a DE in college, but at 6’3” 267, he is being projected as a line-backer in 3-4 defenses. Several 3-4 teams have had interest in Kerrigan, and he should be available when the Patriots make their first pick of the round. Kerrigan would provide a good outside-backer to go with ILB Jerod Mayo and shore up the front 7. While the Patriots don’t have many immediate needs, the futures of Matt Light and Logan Mankins are uncertain at this point, so getting some additional depth on the offensive line may be considered here. While the Chargers may have had one of the best defenses on paper last year, it was clear that they need another pass-rushing presence at DE or LB, and I really don’t expect them to stray from either of those positions in the first round. The Chargers have been strongly linked to Ryan Kerrigan; Brooks Reed could be a possible candidate here as well. It’s not even clear who the Giants start would be at left tackle right now, and that’s a very bad thing. With a deep crop of first round tackle prospects this year, I fully expect the Giants to draft the best available. In this mock, it’s Castonzo, though he very well could be gone. If so, the Giants would probably end up with Gabe Carimi or Derek Sherrod. The Bucs are another team seeking a pass-rusher, with most analysts having DE as their top need. I think Tampa would be thrilled if Bowers, Smith, or Watt somehow fell to them at 20. With those prospects gone, I’m going to go out of a limb and say they go for Jimmy Smith. Ronde Barber is 36 years old, and Jimmy Smith is talented enough to take over when the time comes. While there have been many reports raising red flags about his character, Jimmy Smith turned in a combine performance that was right up there with Patrick Peterson’s; not a bad spot for the Bucs to take a risk on that kind of talent. SHAQ: The Bucs desperately want a great pass rushing defensive end. Then Aqib Talib goes and gets himself arrested—for aggravated assault no less. Tampa Bay nabs Jimmy Smith. The chiefs could address several needs with this pick, but I think they’re going to get a lineman. The offensive line could use another tackle opposite Brandon Albert, but unless they really like one of the remaining prospects available, Wilkerson will be an immediate asset on the defensive line. With two defensive tackles likely two become free agents, Wilkerson can be a versatile player on the line. At 6’4”, 314 lbs, he could step in at DT if need be, or slide over to end should the Chiefs retain one of their existing tackles.